It’s that time of year when all the mistakes and discrepancies of our fields stare at us blatantly in the face, so if you’re a little squeamish, you might want to look away from this one. Ideally, your entire field would now be running out of nitrogen and beginning to senesce down evenly. Since this is a pretty tall order for us as farmers, the best we can do is try to learn from this year, and see if we can do better on our next attempt. I look at this as my report card for the entire year. Soon we will be coming through the fields with a combine running a head at least 20 feet wide and blending all of these mistakes together into a comparatively dull yield map. If you can stomach the truth, it’s time to understand exactly WHY the yield map will look the way it does. Let’s take a look at the nitrogen equation in corn. Start by looking closely at the visual picture and identifying all the places that are turning yellow, or are already dead. Now compare these to the areas that are still lush green. 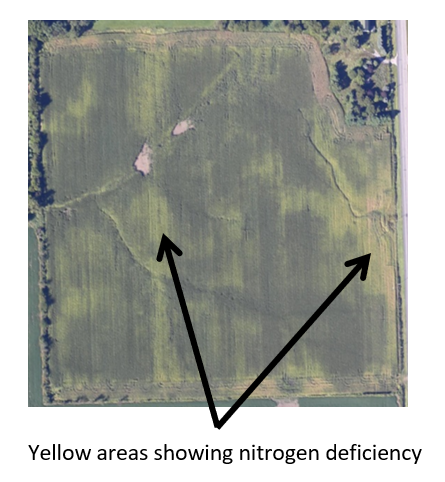 These are two good places to do stalk nitrate tests. Although it may be easy to write off those bad places to lack of water or some other problem, the simple fact is that most of these areas experienced a compounded problem that may very well have been controlled. I also like to pull tests from an area where the Fat Kids lived, and compare it to the Skinny Kids’ areas. For the past few years, our Skinny Kid areas are still showing higher stalk nitrate tests than the Fat Kids even though we fed the Skinny Kids less. This helps me learn more about nitrogen uptake and fine-tune my nitrogen application program for the coming year. 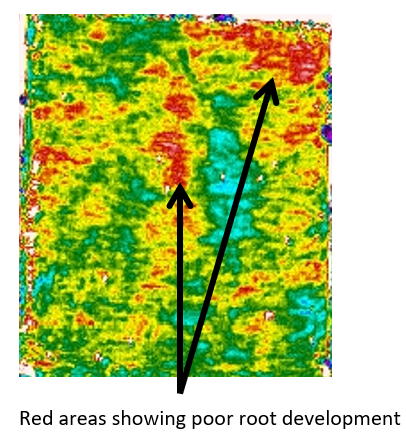 With regard to soybeans, these images will reveal much about how your root system developed and show everything from compaction to nematode damage. The thermal imagery is especially helpful with this as the plants are working hard to fill pods. Look for those hot areas, and do some investigating as to why they are struggling, or giving up for the season. Disease is very common right now and Sudden Death Syndrome is rearing its ugly head. Also be on the lookout for weed escapes. These can be easily seen in the visual pictures, and you can even get an idea as to how tall they are by reading their shadows. A quick reaction time is now essential to keep them from going to seed. If you are already too late, at least make a note of these areas so you are prepared to do battle next year. I guarantee this is a problem that won’t go away. Thanks again for spending time with me, and I sincerely appreciate all of you who have reached out to me with words of encouragement about this bimonthly newsletter. I will always be a student of agriculture, and never want to come off as professing to know it all. I’ll be back with you in a few weeks to talk about how you can use our imagery for harvest priority, and how to upload your yield maps into the AirScout system. If you have any questions about the imagery, or are ready to enroll with AirScout for 2019, please let us know.Take care, be safe, and best wishes on a bountiful harvest!